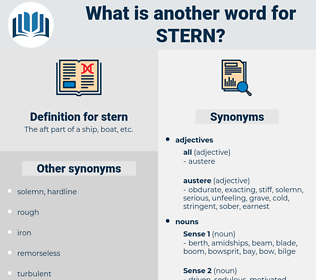 What is another word for stern? The aft part of a ship, boat, etc. stringent, rigorous, serious, grim, draconian, stark, rearmost, strenuous, formidable, restrictive, robust, tight, resolute. strict, harsh, tough, strongly-worded, solemn, strong, vigorous, stiff, drastic, rigid, firm, strong-worded, energetic. gentle, calm, bland, mild, meek. hopeful, happy, bright, sunny, joyful. pleasant, nice, merciful, sympathetic, sensitive. agreeable, willing, cheerful, harebrained, merry, tolerant, yielding, pliant, fancy, complaisant, acquiescent, giddy, compliant, mirthful, inviting, lighthearted, frivolous, pleasing, patient, placable, accepting, silly, responsive, tractable, compromising, undemanding, amenable, goofy, affable, scatterbrained, genial, featherbrained, laid-back, light-headed, forbearing, pliable, flighty, tranquil, glad, sweet, lenient, quiet. I kept along close to the side of the ship until I gained the stern, and then left the ship. I demanded, in a stern voice; " why are you not with your regiment?" 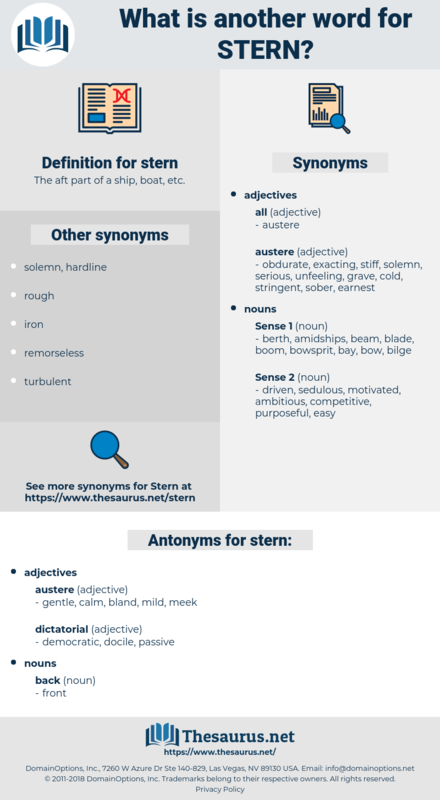 strawman, sectarian, sauterne, Stearn, saturnine, strawworm, straw man, southern, strain, stearin, stateroom, sweat room, styrene, stroma, struma, strymon, storeroom, Stearne, strum, side drum, stream, stroheim, Sudatorium, squadron, squad room, sterna, styron, sternum, saturnia, stirn, sterninae, state attorney, storm, saturn, stormy, sheet iron, sidearm, sturn, side arm, sterne, straw wine.